So I guess this was supposed to happen yesterday. To be honest, the listless A to Z was, in fact, listless, and I was busy, so I pretty much just put it all behind me and carried on. But it seems only fair to offer my reflections and opinions, if anyone is listening. Does that sound cynical? There may be a reason for that. You see, because of my time zone and my personal schedule (I could, of course, have posted at 3 the afternoon before and put my links up when the Brits did. But I don't want to), I ended up posting my link in the comments pretty much dead last every day. And that attracted about...zero...readers. I'm not sure if anyone visited here who wasn't responding to my visits, and frankly, I found people to visit by following comments on my friends' blogs. As a means of publicizing and promoting my blog, it was not, in fact, worth the touted "five minutes a day" (and yes, I resented the implication in the survey that if I didn't like having to go and post the links daily I just wasn't prioritizing publicizing my own blog. In point of fact, my blog is NOT my priority. Writing novels is my priority. And I want to publicize both in ways that work). Okay, grumps aside, I did find some fun new blogs to follow, or at least to follow in A to Z (this is something I have run up against before, and one reason I think that Jemima Pett had it completely right when she decided to blog as she always does, and just tie it in to the letters: blogs are often very different in A to Z than they are the rest of the time. That includes mine, most years). 1. I had some fun, exploring characters from my own and my friends' books. 2. Because none of us knew how to find new blogs, I think I had more people coming back to read multiple posts than usual. 3. #2 may mean more real followers. 4. I spent too much time finding links to follow. 5. Without the linky list and the codes telling me what kind of blog each was, I wasted a fair bit of my limited visiting time checking out blogs that I had no interest in. 6. Most of the month, my book sales were even flatter than usual (there was a flurry right at the end of the month. Did I post something that drove a few sales, or is it coincidence?). 7. May partly explain #6: my participation in all my social media dropped off during the month, because I have only so much time for it, and I was using most of it to post and visit. My conclusion? I probably won't do A to Z again, and not just because of the loss of the linky-list. I think that as a writer I'm moving beyond that. My priority is writing, and not blogging, though I don't deny the importance of the blog for getting my name and my books out there. What it does make me think is that I may want to revisit how I manage my blog. 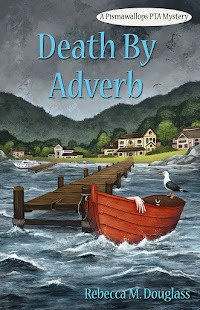 So maybe that's a benefit of A to Z. Blog hops do help people find you (though I sometimes wonder if anyone but other bloggers ever reads any of us! ), but I actually find smaller hops more effective. Somehow, when the list is only a couple of dozen long, I'm more apt to visit more blogs. Go figure. They can also be more focused on what I'm doing. Apologies for the long and grumpy post. April was a tiring month, and May is shaping up to be harder. I've no doubt it shows. Click on the survivor badge above to find the Reflections post with the links in the comments, to read other bloggers' reactions. Hi Rebecca - I agree with what you're saying ... I'm not sure how people found me - possibly because I was at the 60s mark in the list ...but I suspect from other commenters. Well, I found you through Jemima's blog, though I don't think that was the first time. And I think that you've put a finger on part of the dissatisfaction that people like you and Jemima and I are feeling: this seems more for novices in some ways. I had a lot of similar experiences to yours. The point about selling books was interesting though - the last time I did A-to-Z coincided to when I published my first book. I wrote more personal posts that time, and met a lot of new people, so it definitely had an impact on sales. This time? No impact. Like, at all. I didn't actually do the A-to-Z solely for the purpose of selling books, but it would have been nice, you know? I don't do it just for the sake of sales, but ultimately, that's what the blog is about, and this year I was directing it a bit more that way (thus the posts about my own characters). And if I don't get more readers, and don't get book sales, then I have to ask what I'm doing it for, as well as what I'm doing wrong. This was my first A to Z so I have no opinion on the linky list. I found that I checked out blogs on the main A-Z comments page for each letter during the first week. I tended to go to those who included something of interest about their blog in their comment. After the first week, I primarily found new blogs in the links of comments on blogs I had already found. Now that April is over, I am discovering just how many I missed. I'll check out your books! I think that's a good point about including something about the post in the comment list. I noticed I used those to help me pick blogs to check out (until I did like you, and just followed the rabbit-trail of comments on blogs I was following). And I still don't think I managed to say much about my posts when I put up the comment with the link! I agree with some of your points, it was hard to find lots of new blogs and after the first week I mainly prioritised keeping up with those I was already following. I don't think the Challenge should be about marketing as such (although I did do posts relating to my own work), but about having fun and being surprised by interesting topics, and on that side it was a big tick. There were loads of great themes out there to be found! I agree that the Challenge isn't and shouldn't be specifically about marketing, but as noted, the whole point of an author blogging is to build an audience. If I'm not building an audience, then maybe the Challenge isn't doing what I need. I do enjoy discovering new things, and learning strange stuff. Well, Rebecca, that was pretty grumpy! But I get what you're saying as well as the negative sides to what others have found in the A to Z Challenge. As is said though there are more than one side to anything and it's a matter of how you approach it, what your expectations are, etc, etc. 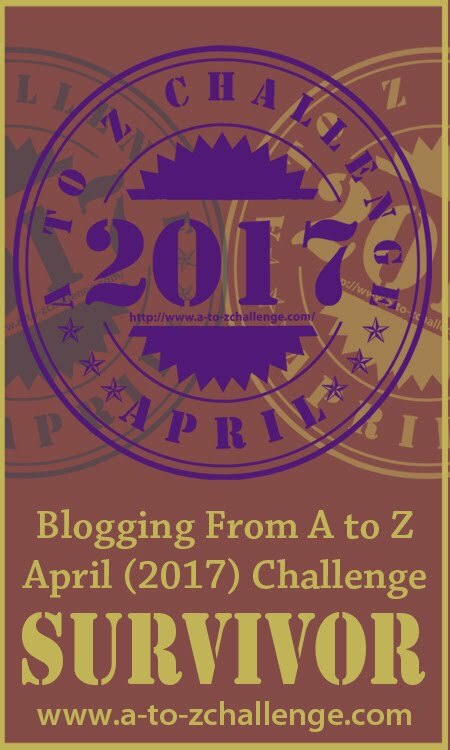 As Jemima said, I've always approached A to Z mostly like I normally blogged, which makes sense since that how I started the Challenge in 2010 when there was no list and A to Z was just a blogging stunt for me. The list became a good tool, but something I rarely used other than being the hindrance it was for me as a co-host having to maintain the monster of a thing. A better list is indeed something sorely needed as well as improving the social media approach we used this year (which many liked a great deal including the co-hosts because we didn't have to waste time with that darn list). As I have always maintained from the beginning, the Challenge is, or should be, different things for different people--marketing, networking, honing skills, or whatever--and it's up to each blogger to figure that out and make it work for them. But to me that's the same for blogging. Sorry to hear about the negative aspects for you in the 2017 Challenge, but I'm glad there were some positives. Each year the A to Z Team has attempted to try new things to tweak the Challenge to make it better, more fun, more rewarding. Some things work, some don't. A to Z will never be perfect for everyone, but hopefully there will always be some new aspect that will be of benefit to some. Thanks for playing along this year and for offering your very candid point of view regarding A to Z. After a year of recovering, who knows, you might find yourself back next year with a new sense of optimism about the whole crazy affair. If you do decide to do it again, emphasize the fun factor because ultimately that's what the A to Z Challenge is mainly about. Thanks for coming by and responding, Arlee. I certainly get the need to do something about the massive list. A to Z may actually be suffering from its own success! You should be proud of what you've done. And will I find myself doing it again next year? 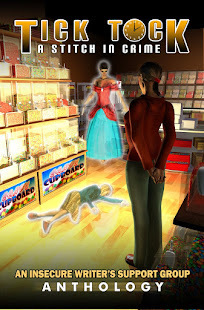 Knowing me, the odds are high :) Or I may once again try it as a reader rather than a poster, and try to find more cool blogs and share more of them, as I did last year. It seems only fair to add, now that I've done the actual accounting for April, that my sales for the month DID show a visible bump. So maybe what I did here during April 2017 wasn't useless (and I noticed I had an even bigger bump last April, when I wasn't doing AtoZ, but just visiting, which also increased visitors to my blog, though I think that time I was also running a sale on one of my books).